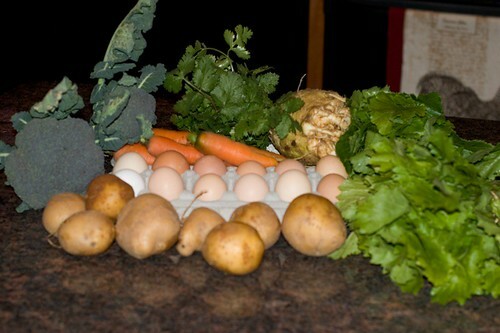 So only one more week of the CSA and then I’ll have to start buying eggs at the grocery again. Sorry for the sporadic posting, things have been a little crazy here, more on that later. Anyway, we got lots of autumn goodness today and tomorrow we’ll be having soup for dinner using lots of it. I’m the kind of person who doesn’t like to eat her veggies, but this photo — the composition, the colors — is downright yummy. I specially love the multi-clored eggs.